If you are looking for people-oriented, docile pets, Ragdoll kittens are the perfect match. 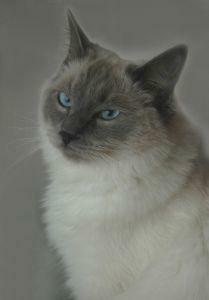 This is one of the few cat breeds who will welcome you home at the door! The origin of Ragdoll kittens as a breed has never been crystal clear. It's generally accepted these cats were the product of a 1960's cross-breeding between a Persian and a Burmese, but it's never actually been confirmed whether the parents were purebreds in their own right. Whatever the true story may be, breed pioneer Ann Baker fell in love with the results and set out to establish her beloved Ragdolls. Seeking to expand the breeding program, but wanting to maintain some control over the profits, Ann took the controversial step of contracting breeding pairs out to other homes, and charging a royalty on every kitten sold. Further fanning the bonfire over the breed's legitimacy, Ann was attributed as making fairly outrageous claims about the cats' genetics. Obviously, these kinds of statements, although certainly designed to create publicity for the developing breed, really served to make the breeders already working with her a bit apprehensive. As a result, Ann Baker lost a good deal of her credibility with the larger cat community. Murky origins aside, many people still found Ragdoll kittens made lovely, affectionate pets, and began backing away from Ann and operating breeding programs on their own. Enter Denny and Laura Dayton. The Daytons took on the monumental task of legitimizing Ragdolls, and making them a recognized breed with the Cat Fancier's Association. Through their selective breeding program, they were able to establish a basic "type" and develop a standard for the breed. Today, this couple is recognized as the saviors of the breed, which might have disappeared without their guiding hands. At a glance, the breed is rather bulky in appearance, and this is probably why they enjoy such a reputation as cuddlers. Ragdoll kittens do not completely share the extreme features of their Persian ancestors, however, their eyes are always large and blue. The breed does not attain full maturity until approximately four years of age. Ragdoll kittens have incredibly soft, rabbit-like fur. When first born, their coats are pure white or pale cream in color. They normally don't begin to show their initial coloring until approximately ten days old. As their coats mature, the coloring becomes pointed at the extremities, similar to Siamese cats. The bodies are significantly lighter in color than the legs, tail and faces. Coats normally don't attain full coloring until these cats reach about two years of age, so they are slow to mature by some standards. Although the breed appears almost long-haired because of the fullness of the coat, it is really only considered a medium-length breed, making these cats much easier to maintain than truly long-coated breeds. Color point: This pattern shows a definite color contrast between the body and the points. Mitted: The points in this pattern are very dark in contrast with the body, and the front feet have white "mitten" markings. Bi-color: The pattern shows a definite mask, appearing as a symmetrical, inverted "V". In this instance, the nose leather is pink. Lynx Point: This pattern overlays the above patterns, and shows ticking or stripes on the face. Tortie Point: This pattern overlays the above patterns, and mixes in red or cream with the other colors. Torbie: These cats are a mix of Tortie and Lynx breeding, and have both stripes and red/cream coloring. Although the breed as a whole is fairly hearty, there have been significant occurrences of a genetic heart defect known as Hypertrophic Cardiomyopathy. In all fairness, this condition is one of the most common health concerns found across all cat breeds, and one that many breeders are working to remove from their breeding programs.Hypertrophic Cardiomyopathy presents as a thickening of the left heart chamber, causing the heart to pump inefficiently. The problem is often uncovered as a secondary diagnosis to a heart murmur, and can be detected with an ultrasound. As the name implies, Ragdoll kittens are very laid back and placid. They are not aggressive, and are believed to lack the instinct to fight back when attacked. Just like puppies, Ragdolls will follow you around the house, and greet guests at the door. They love to be held, and are very playful, especially with their toys. Unlike most cats who hide when company visits, Ragdolls like to make themselves the center of attention. The Ragdoll Fanciers' Club International was started in 1975 and operates as a governing body for breeders who sell Ragdoll kittens. All members are required to sign a code of ethical conduct that likely has its roots in the breed's unorthodox history.